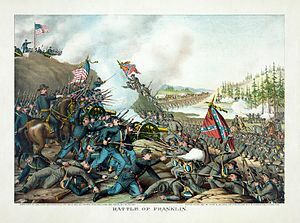 The Battle of Franklin was fought on November 30, 1864, in Franklin, Tennessee, as part of the Franklin–Nashville Campaign of the American Civil War. It was one of the worst disasters of the war for the Confederate States Army. Confederate Lt. Gen. John Bell Hood's Army of Tennessee conducted numerous frontal assaults against fortified positions occupied by the Union forces under Maj. Gen. John M. Schofield and was unable to break through or to prevent Schofield from executing a planned, orderly withdrawal to Nashville. The Confederate assault of six infantry divisions containing eighteen brigades with 100 regiments numbering almost 20,000 men, sometimes called the "Pickett's Charge of the West", resulted in devastating losses to the men and the leadership of the Army of Tennessee—fourteen Confederate generals (six killed, seven wounded, and one captured) and 55 regimental commanders were casualties. After its defeat against Maj. Gen. George H. Thomas in the subsequent Battle of Nashville, the Army of Tennessee retreated with barely half the men with which it had begun the short offensive, and was effectively destroyed as a fighting force for the remainder of the war. Sherman's march left the aggressive Hood unoccupied, and his Army of Tennessee had several options in attacking Sherman or falling upon his rear lines. The task of defending Tennessee and the rearguard against Hood fell to Maj. Gen. George H. Thomas, commander of the Army of the Cumberland. 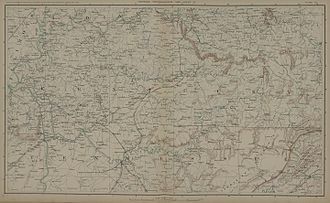 The principal forces available in Middle Tennessee were IV Corps of the Army of the Cumberland, commanded by Maj. Gen. David S. Stanley, and XXIII Corps of the Army of the Ohio, commanded by Maj. Gen. John Schofield, with a total strength of about 30,000. Another 30,000 troops under Thomas's command were in or moving toward Nashville. Rather than trying to chase Sherman in Georgia, Hood decided that he would attempt a major offensive northward, even though his invading force of 39,000 would be outnumbered by the 60,000 Union troops in Tennessee. He would move north into Tennessee and try to defeat portions of Thomas's army in detail before they could concentrate, seize the important manufacturing and supply center of Nashville, and continue north into Kentucky, possibly as far as the Ohio River. Hood even expected to pick up 20,000 recruits from Tennessee and Kentucky in his path of victory and then join up with Robert E. Lee's army in Virginia, a plan that historian James M. McPherson describes as "scripted in never-never land." It should be noted here that Hood had recovered from but was affected by a couple of serious physical battle wounds to a leg and arm, which caused him pain and limited his mobility. Hood spent the first three weeks of November quietly supplying the Army of Tennessee in northern Alabama in preparation for his offensive. Schofield's advance guard arrived in Franklin at about 4:30 a.m. on November 30, after a forced march north from Spring Hill. Brig. Gen. Jacob Cox, commander of the 3rd Division, temporarily assumed command of the XXIII Corps and immediately began preparing strong defensive positions around the deteriorated entrenchments originally constructed for a previous engagement in 1863. By noon, the Union works were ready. The line formed an approximate semicircle around the town from northwest to southeast. The other half of the circle was the Harpeth River. Counterclockwise from the northwest were the divisions of Kimball (IV Corps), Ruger (XXIII Corps), and Reilly (XXIII Corps). There was a gap in the line where the Columbia Pike (present day U.S. Route 31) entered the outskirts of the town, left open to allow passage of the wagons. About 200 feet (61 m) behind this gap, a 150-yard "retrenchment" line was constructed of dirt and rails, which was intended to be a barrier to traffic, not a full-fledged defensive earthwork. (The gap was also defended by the guns of Battery A, 1st Kentucky Artillery. The men of the 44th Missouri also extended the retrenchment line to the west along their front with hastily dug trenches.) The actual earthworks in the southern portion of the line were formidable. Attacking infantry would be confronted by a ditch about four feet wide and two to three feet deep, then a wall of earth and wooden fence rails four feet above normal ground level, and finally a trench three to four feet deep in which the defenders stood, aiming their weapons through narrow "head gaps" formed by logs. In the southeast portion of the line, Osage-orange shrubs formed an almost impenetrable abatis. Just behind the center of the line stood the Carter House, appropriated as Cox's headquarters. Just east of the pike was the Carter cotton gin building, around which a minor salient occurred in the Union earthworks. Schofield established his headquarters in the Alpheus Truett House, a half mile north of the Harpeth on the Nashville Pike, although he would spend most of his time during the battle in Fort Granger, built in 1863 as an artillery position northeast of the town. While fighting raged at the center of the Union line, the Confederates of Stewart's corps also advanced against the Union left. Because the Harpeth River flowed in that area from southeast to northwest, the brigade found itself moving through a space getting progressively narrower, squeezing brigades together into a compressed front, delaying their movements and reducing their unit cohesion. Walthall's division was pressured so much from the right that it temporarily fell in front of Cleburne's advance. They were all subjected to fierce artillery fire not only from the main Union line, but also from the batteries across the river at Fort Granger. They also had significant difficulty pushing through the strong osage-orange abatis. Hood, who remained at his headquarters on Winstead Hill, was still convinced that he could pierce the Federal line. At about 7 p.m., he deployed the only division of Stephen D. Lee's corps that had arrived, commanded by Maj. Gen. Edward "Allegheny" Johnson, to assist Cheatham's effort. They moved north on the west side of the Columbia Turnpike and passed around Privet Knob, Cheatham's headquarters, but were unfamiliar with the terrain in the dark and Cheatham told Lee he had no staff officer left who could guide them. Both Bate and Cheatham warned Lee not to fire indiscriminately against the Federal works because Confederates were pinned down there on the outside. Johnson's men lost their unit alignments in the dark and had significant difficulties attacking the works just to the west of the Carter House. They were repulsed after a single assault with heavy losses. In addition to Chalmers's actions in the west, across the river to the east Confederate cavalry commander Forrest attempted to turn the Union left. His two divisions on Stewart's right (Brig. Gens. Abraham Buford II and William H. Jackson) engaged some Federal cavalry pickets and pushed them back. They crossed the Harpeth at Hughes Ford, about 3 miles (4.8 km) upstream from Franklin. When Union cavalry commander Brig. Gen. James H. Wilson learned at 3 p.m. that Forrest was crossing the river, he ordered his division under Brig. Gen. Edward Hatch to move south from his position on the Brentwood Turnpike and attack Forrest from the front. He ordered Brig. Gen. John T. Croxton's brigade to move against Forrest's flank and held Col. Thomas J. Harrison's brigade in reserve. The dismounted cavalrymen of Hatch's division charged the Confederate cavalrymen, also dismounted, and drove them back across the river. Some of Croxton's men were armed with seven-shot Spencer carbines, which had a devastating effect on the Confederate line. Wilson was proud of his men's accomplishment because this was the first time that Forrest had been defeated by a smaller force in a standup fight during the war. 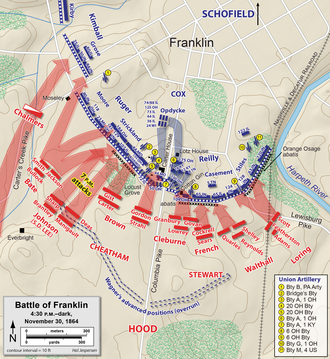 The devastated Confederate force was left in control of Franklin, but its enemy had escaped again. Although he had briefly come close to breaking through in the vicinity of the Columbia Turnpike, Hood was unable to destroy Schofield or prevent his withdrawal to link up with Thomas in Nashville. And his unsuccessful result came with a frightful cost. The Confederates suffered 6,252 casualties, including 1,750 killed and 3,800 wounded. An estimated 2,000 others suffered less serious wounds and returned to duty before the Battle of Nashville. But more importantly, the military leadership in the West was decimated, including the loss of perhaps the best division commander of either side, Patrick Cleburne, who was killed in action. Fourteen Confederate generals (six killed, seven wounded, and one captured) and 55 regimental commanders were casualties. Five generals killed in action at Franklin were Cleburne, John Adams, Hiram B. Granbury, States Rights Gist, and Otho F. Strahl. A sixth general, John C. Carter, was mortally wounded and died later on December 10. The wounded generals were John C. Brown, Francis M. Cockrell, Zachariah C. Deas, Arthur M. Manigault, Thomas M. Scott, and Jacob H. Sharp. One general, Brig. Gen. George W. Gordon, was captured. Also among the dead was Tod Carter, the middle child of the Carter family. Having enlisted in the Confederate army three years earlier, Carter had returned to his hometown for the first time since then, only to be wounded in battle just a few hundred yards away from his own house. He was found by his family after the battle, and died early in the next day. The Army of Tennessee was all but destroyed at Franklin. Nevertheless, rather than retreat and risk the army dissolving through desertions, Hood advanced his 26,500 man force against the Union army now combined under Thomas, firmly entrenched at Nashville which numbered more than 60,000. Hood and his department commander Gen. P.G.T. Beauregard requested reinforcements, but none were available. Strongly outnumbered and exposed to the elements, Hood was attacked by Thomas on December 15–16 at the Battle of Nashville, defeated decisively and pursued aggressively, retreating to Mississippi with just under 20,000 men. The Army of Tennessee never fought again as an effective force and Hood's career was ruined. Hood's continued pursuit of Schofield after suffering defeat at Franklin and his refusal to withdraw before the battle of Nashville caused Schofield to remark "I doubt if any soldiers in the world ever needed more cumulative evidence to convince them that they were beaten." Much of the rest of the Franklin battlefield has been lost to commercial development. The spot where Gen. Cleburne fell, for instance, was covered until late 2005 by a Pizza Hut restaurant. City officials and historic-preservation groups have recently placed a new emphasis on saving what remains of the land over which the battle raged. In 2006 0.5 acres (0.20 ha) of land bordering the southwestern end of the Carter House property was acquired with help of the Civil War Trust (a division of the American Battlefield Trust) and local organizations. This land was part of 2 acres (0.81 ha) that made up the Carter Family Garden, which during the battle saw tremendous fighting and was part of a brief Confederate breakthrough. After the purchase, a house, out-buildings, and a swimming pool were removed. During excavation of the original Federal entrenchments some human bones were found. On November 24, 2010, the State of Tennessee awarded a $960,000 enhancement grant from the Tennessee Department of Transportation to help purchase the property where the Domino's Pizza and mini-mart is located. A local preservation organization is also hoping to purchase 16 acres of land in two parcels: five acres located southwest of what is now a small park called the Collin's Farm located at the southeast corner of the Lewisburg Pike and the Nashville and Decatur Railroad that was preserved a few years ago; and 11 acres located near the corner of Lewisburg Pike and Carnton Lane. The American Battlefield Trust and its federal, state and local partners have acquired and preserved a total of 178 acres (0.72 km2) of the battlefield in more than 10 different transactions since 1996. ^ a b c d e f Eicher, p. 774. ^ McPherson, Battle Cry, p. 808; Connelly, pp. 477–78; Eicher, pp. 736–37; Jacobson, pp. 29–30; Sword, pp. 45–46. ^ Jacobson, p. 41; McPherson, Battle Chronicles, p. 179; Welcher, p. 583. ^ McPherson, Battle Chronicles, p. 180; Jacobson, pp. 44–47; Sword, pp. 68, 72–73; Nevin, p. 82. ^ McPherson, Battle Cry, p. 811. ^ Sword, pp. 68–70, 74; McPherson, Battle Chronicles, p. 180. ^ Sword, pp. 93–95; McPherson, Battle Chronicles, pp. 181–82; Welcher, p. 588; Eicher, p. 770; Nevin, p. 88. ^ Jacobson, pp. 53, 55, 72–75; Eicher, p. 770; Sword, pp. 84, 89, 91; McPherson, Battle Chronicles, pp. 180–82; Welcher, pp. 586–88; Nevin, pp. 82–83, 88. ^ Jacobson, pp. 105–68; Eicher, p. 771; Sword, pp. 124–54; Kennedy, p. 392; Welcher, pp. 589–90. ^ Eicher, p. 772; Sword, pp. 159–60; Jacobson, pp. 199–203; Welcher, pp. 590–91. ^ Sword, p. 167; Jacobson, p. 198; Welcher, pp. 591–93. ^ Jacobson, pp. 208–12; Welcher, p. 593; Sword, p. 167; Eicher, p. 772. ^ Sword, pp. 171–77; Jacobson, pp. 219–21, 228, 230; Welcher, p. 594. ^ Sword, pp. 197–98; Welcher, pp. 593, 597. ^ Sword, pp. 178–80; Niven, pp. 98–100; Jacobson, pp. 241–42, 247. ^ Jacobson, pp. 239–40. For examples of the popular view promoting Hood's anger and resentment, see Sword, p. 179, McPherson, Battle Chronicles, pp. 188–89, and Niven, pp. 95–96. ^ Welcher, p. 595; Sword, p. 180; Jacobson, pp. 243–47; McPherson, Battle Chronicles, p. 189. ^ Sword, pp. 448–51; Eicher, pp. 770, 774. Although Schofield was the commander of the Army of the Ohio through 1865, historians of the campaign do not always use this designation for the combination of corps assembled against Hood, referring in some cases only to the "Federal Army." See, for example, Welcher, pp. 599, 611; Sword, p. 448; Jacobson, p. 452. ^ Eicher, p. 769. At the start of the Atlanta Campaign, Hood was appointed a temporary "full" general, but this appointment was never confirmed by the Confederate Congress and was later rescinded. ^ Nevin, p. 103; Jacobson, pp. 259–60, 273–74, 278–82; Sword, pp. 189–96; McPherson, Battle Chronicles, pp. 189–91. ^ Welcher, p. 595; Nevin, p. 105; Jacobson, pp. 259–60, 273–74, 278–82; Sword, pp. 194–96; McPherson, Battle Chronicles, p. 191. ^ Welcher, p. 595; Jacobson, pp. 319–28, 332–34; Sword, pp. 199–206; Nevin, p. 112. ^ Jacobson, pp. 328–29, 322; Welcher, pp. 595–96; Nevin, p. 112. ^ Sword, pp. 221–24; Jacobson, pp. 323, 308, 315, 310, 286; Nevin, pp. 114–15; Welcher, p. 596. ^ Jacobson, pp. 286–87, 329–30. ^ Welcher, pp. 596–97; Sword, p. 292; Jacobson, pp. 244, 262, 285. ^ Jacobson, pp. 299–305, 339–43; Sword, pp. 216–18, 226–27; Niven, pp. 114–15. ^ Jacobson, pp. 292–93, 298; Sword, pp. 218–19; Welcher, p. 597. ^ Jacobson, pp. 356–58; Sword, pp. 238–42. ^ Jacobson, pp. 377–85; Sword, pp. 245–47. ^ Jacobson, pp. 358–61; Niven, p. 117; Sword, p. 241; Welcher, p. 598. ^ Horn, pp. 402–03. Horn understates the losses of Pickett's Charge. Pickett's division alone suffered 2,655 casualties (498 killed, 643 wounded, 833 wounded and captured, and 681 captured, unwounded) and total Confederate losses during the three-division attack were 6,555. Thus, total casualties were somewhat comparable, although the loss in senior officers at Franklin was far worse—more so than Horn's 1941 description states. ^ Niven, pp. 117–18; Sword, pp. 243, 248–51. ^ Jacobson, pp. 418–20. Jacobson presents a full list of all of the officers who were casualties during the battle. ^ Current unpublished research by Carter House historian David Fraley has identified Union killed at Franklin to be in excess of 600 and perhaps as many as 800. However, this list may include men who had fought at Franklin and died in captivity or in the Sultana explosion in April 1865. ^ McPherson, Battle Cry, p. 813. ^ "Carter Cotton Gin foundation unearthed during excavation", Brentwood Home Page, May 14, 2015. ^ "Small strip mall, Domino's Pizza to give way to new battlefield park", Tennessean, November 30. 2010.